Like I've said before, I'm involved in (more than) two shuls. New North London - Masorti (conservative), small-p progressive, egalitarian service if I want one. Shomrei - Federation, frum, ladies' gallery and a mechitza . That's - to me - like a double decker: those women who wear a sheitel and a hat. I have history with the concept of mechitza. Like, I don't have a problem with separation, and in fact when I go to an egal service, I feel, sometimes, a little uncomfortable sitting with men. I mean, I don't mind; it's just feels, well, odd. That's all. Maybe everyone's default position (like with toothpaste: colgate) is what they grew up with. And I grew up in place that also had a troubled relationship with mechitza. Backstory: US (United Synagogue) style shul. Cheadle. The seventies. Maybe, the eighties. We had a mechitza, and then a Dayan (head of the law courts) was coming to shul for something, and someone (I know who, but I'm not saying) took it upon themselves to ask if the mechitza was kosher. On a nisht freg shilah basis, it of course turned out not to be. Show me a Jewish community, and I'll show you (a) someone who asks a silly question, and (b) an argument/broigus/ferribul (sometimes, multiple-broiguses). I'm biased, because my Dad negotiated the revised mechitza agreement with the Dayan. But the results were great: 5'5 1/2 inches from the men's side (meets the Rav Moshe Feinstein ruling), but raised on a short platform from the women's side. So I could see, feel, participate, be. I'm biased because in Cheadle, women did their thing. I honestly didn't know till I got to London that there was angst about women being honorary officers or playing big roles in traditional (orthodox) shuls. Auntie Sheila ran the cheder. Eve ran a lot of other things. I was surrounded by strong women role models, and the thought never crossed my mind that the rest of my (Jewish) life might not be like that. Slight lie: I remember this. Aged ten, eleven, I used to love opening the Ark (men's side). Bang in the thick of it, participating. And then one day, nearing my batmitzvah, my Dad said to me, you better go and sit with Mum, now. And of course, it was nice to sit with my Mum, but I (a) felt slightly banished and (b) had a little nostalgia for the great time I'd had in the middle of the action. But hey. So in Cheadle, at Yeshurun, things were different. I remember Alan, the Rov, used to do audience participation-style sermons, and would often ask questions across the mechitza. Because he was also my (university) tutor, he liked to keep me on my toes, checking a reference or something with me. 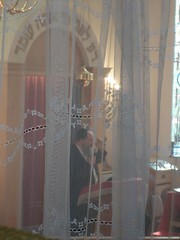 I never slept during his sermons (a traditional Anglo-Jewish shluff time, although rarely, if ever, in Cheadle). And then I came to London. The goldene medina, sure, but I found about the gender divide, and those thick net curtains (I lived in Hendon, the first couple of years) that are quite like having very bad eyesight. So this picture, this is what it looks like from my side of the mechitza. Actually, it's better than it usually is, because this is downstairs, and usually we're upstairs so it's both obscured with the net curtain and at a very steep angle (they don't call it Radio Shomrei for nothing; you can only see on the front two rows from upstairs). Don't get me wrong, I'm not militant. I'm not campaigning. I'm just saying. I know there are those (women) who find it more spiritual to be separate, separated, and only hear. Prayer is personal. YMMV. Blah blah blah. I'm just acknowledging what it's like. And what it's like is like being in a long queue for your cataract operation, and in the meantime, everything's a little hazy. With patterns. Patterns like the sort of tableclothes frum people in Golders Green use on shabbes. Just like I love my friends and accept their imperfections (and hope they do mine, which are legion), I feel the same about my communiti(es). So I love the warmth, connectedness, genuine friendship and just-got-home feeling I get from Shomrei. But when I'm davening, I feel like a bystander. Last year, a non-Jewish friend of mine came to shul with me quite a few times. And he said something very interesting. He said, this shul, which you love and care about, I can just walk in, and sit downstairs, and be in the middle of the action. And you're upstairs, watching. It doesn't seem fair. True. Ish. I guess. I remember in Bnei Akiva they always used to spin us this different-but-equal shtick on gender roles in traditional Judaism. Which is true. Except that, it's the only place in my life that's like that. I'm equal (how retro, to even think about that) at work, play, socially, whatever, but in this one, important place, it feels like I have to watch. I'm not campaigning for change in orthodoxy. I know there are other orthodox shuls (Jerusalem, New York) who do things differently. But this is my community, my place now, and I accept it how it is. And I also acknowledge the dissonance, frustrations, limitations. I guess a shul with a mechitza you wouldn't ideally choose is like a friend with a particularly bad habit. You still love them, want to hang out with them, think they'r e great company. But you want to overlook their bad habit. You want to turn a blind eye, and love what's great about them. Because, my friends, I'm totally prepared to give the benefit of the doubt. So I really ought to be able to do the same for my shul.